Pickle Dish Stand. 6″ tall. Soft paste porcelain. American China Manufactory. Philadelphia, PA. 1771. Anyone familiar with this stand wont find anything groundbreaking here. Anyone who has never seen it before might wonder why they should bother. These two caveats are critical to understanding what follows. The most striking thing about the stand is it’s mere existence. It is a study in extremes; exacting materials never before used here, complex assembly, intended for the finest dining experiences of the wealthiest Philadelphians, a coral theme that only the intelligentsia could fully appreciate. The sheer audacity of its makers to presume so much! Gousse Bonnin was a Huguenot dilettante whose only previous potting experience was a brief attempt at crucible making. George Antony Morris’ forte was asking his dad for financing and connections. Together, they formed the American China Manufactory in 1770 and immediately aimed for the stars. The pickle stand was their magnum opus. 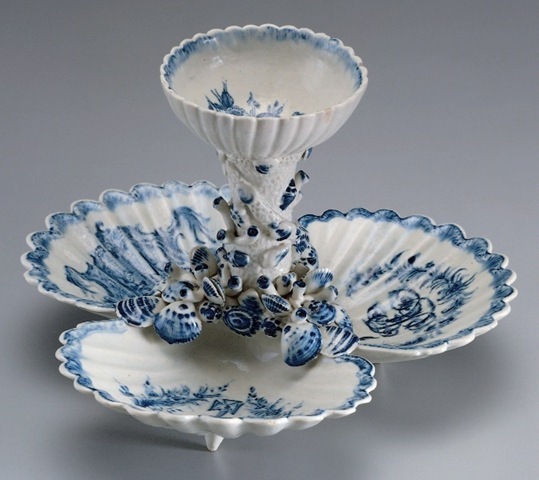 It was a perfect plan – a skilled production team (partly lured away from the Bow Porcelain factory in England), local materials Josiah Wedgwood was envious of, boiling secessionist fever, and for good measure a Nonimportation Agreement passed in the 1760’s to placate colonists after the French Indian War. Local Brahmins Sir Charles Palmer and Benjamin Franklin joined the band wagon. Customers from as far away as Albany, NY were interested. Bonnin and Morris literally begged for help. But people who knew their work preferred imports. People who didn’t just didn’t care. In 1772 Bonnin and Morris ignobly kicked their master potters out on the street. Morris moved to South Carolina and promptly died. Bonnin moped back to England. Encountering one of their six known remaining pickle stands today in the Philadelphia Museum of Art is a humbling experience. It’s in a small case next to a passageway, easy to pass without noticing. Considering the epic struggle behind the stand’s creation it seems inconsequential, nondescript among the room’s finer artifacts. But all that work. All those crushed hopes riding on that fragile little thing. It’s heartbreaking. Almost enough to make one cry. Ceramic in America. Robert Hunter, ed. Chipstone Press/Williamsburg, VA. 2007. You are currently browsing the archives for the American Porcelain Manufactory category.